One of the south central states of the United States; admitted in 1792. Its most important Jewish community is at Louisville (population, in 1900, 204,731, of which about 7,000 are Jews). Two brothers named Heymann, or Hyman, from Berlin, seem to have been the first Jews in Louisville (about 1814). 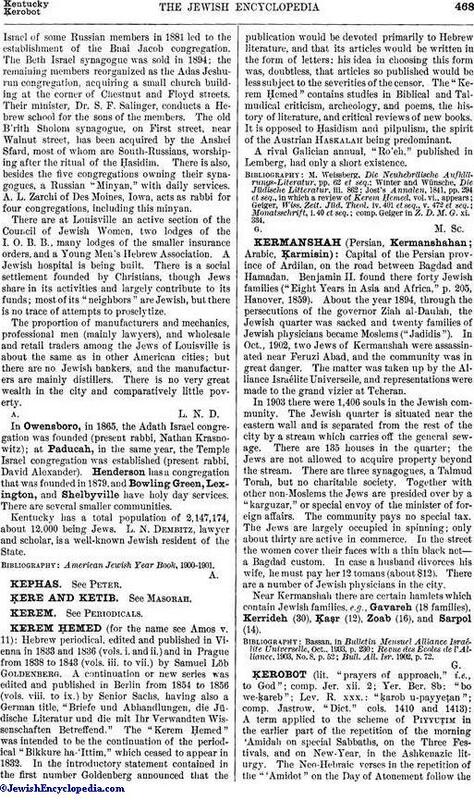 An organized Jewish society appears in the directory for 1832; there are ten names, but no family of the present time claims descent from them. About 1836 there arrived some Polish Jews from Charleston, S. C., and some German Jews from Baltimore, Md., and some direct from Germany; they united in religious work, bought a graveyard, built a miḳweh, and engaged a shoḥeṭ. A few wealthy Jews came from Richmond, Va., but they did not associate with the others and were absorbed by the non-Jewish element. The first regular minister was J. Dinkelspiel, whose signature to a neatly written "ketubah" dated 1841 is still shown. In 1842 the Adas Israel congregation was chartered; the family names of its incorporators still survive. In 1848 it elected B. H. Gotthelf as cantor and shoḥeṭ, and when a secular school was established in 1854 he became its Hebrew teacher. In 1850 a synagogue was built on Fourth street between Green and Walnut streets, which was consumed by fire in 1866. A regular preacher, L. Kleeberg, from Elberfeld, Prussia, was then engaged, who remained till 1878. The secular school was abandoned in 1868, in which year a temple was finished, with a sexton's dwelling, and with Sabbath-school and meeting-rooms. In 1878 Dr. E. G. Hirsch became its preacher, but left in 1880, and, after a short interval, was succeeded by Dr. Adolph Moses (d. 1902). The present (1904) incumbent, Dr. H. G. Enelow, for a short time Dr. Moses' assistant, succeeded him. Adas Israel began with the West German minhag, but went further and further in the direction of Reform. It now uses the Union Prayer-Book, and has Sunday services in addition to the Sabbath worship. 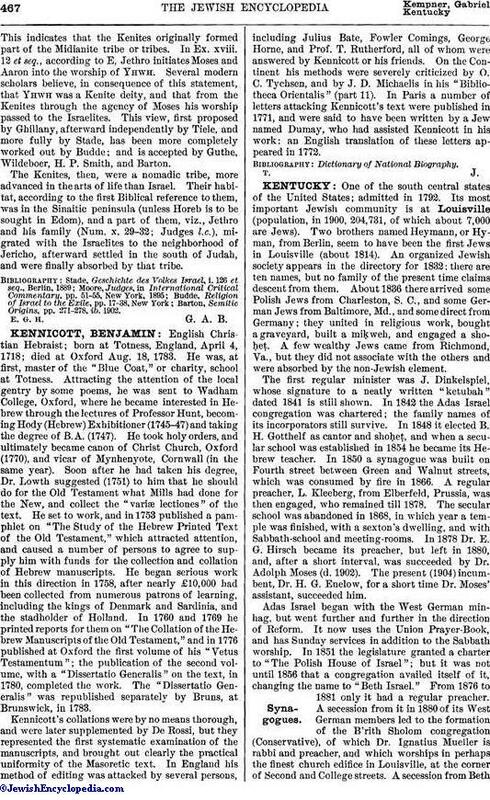 In 1851 the legislature granted a charter to "The Polish House of Israel"; but it was not until 1856 that a congregation availed itself of it, changing the name to "Beth Israel." From 1876 to 1881 only it had a regular preacher. A secession from it in 1880 of its West German members led to the formation of the B'rith Sholom congregation (Conservative), of which Dr. Ignatius Mueller is rabbi and preacher, and which worships in perhaps the finest church edifice in Louisville, at the corner of Second and College streets. A secession from BethIsrael of some Russian members in 1881 led to the establishment of the Bnai Jacob congregation. The Beth Israel synagogue was sold in 1894; the remaining members reorganized as the Adas Jeshurun congregation, acquiring a small church building at the corner of Chestnut and Floyd streets. Their minister, Dr. S. F. Salinger, conducts a Hebrew school for the sons of the members. The old B'rith Sholom synagogue, on First street, near Walnut street, has been acquired by the Anshei Sfard, most of whom are South-Russians, worshiping after the ritual of the Ḥasidim. There is also, besides the five congregations owning their synagogues, a Russian "Minyan," with daily services. A. L. Zarchi of Des Moines, Iowa, acts as rabbi for four congregations, including this minyan. There are at Louisville an active section of the Council of Jewish Women, two lodges of the I. O. B. B., many lodges of the smaller insurance orders, and a Young Men's Hebrew Association. A Jewish hospital is being built. There is a social settlement founded by Christians, though Jews share in its activities and largely contribute to its funds; most of its "neighbors" are Jewish, but there is no trace of attempts to proselytize. The proportion of manufacturers and mechanics, professional men (mainly lawyers), and wholesale and retail traders among the Jews of Louisville is about the same as in other American cities; but there are no Jewish bankers, and the manufacturers are mainly distillers. There is no very great wealth in the city and comparatively little poverty. In Owensboro, in 1865, the Adath Israel congregation was founded (present rabbi, Nathan Krasnowitz); at Paducah, in the same year, the Temple Israel congregation was established (present rabbi, David Alexander). Henderson has a congregation that was founded in 1879, and Bowling Green, Lexington, and Shelbyville have holy day services. There are several smaller communities. Kentucky has a total population of 2,147,174, about 12,000 being Jews. L. N. Dembitz, lawyer and scholar, is a well-known Jewish resident of the State. American Jewish Year Book, 1900-1901.